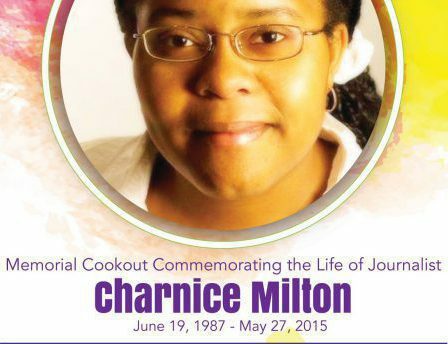 Charnice A. Milton was born June 19, 1987 at George Washington University Hospital to Francine Milton and the late Charles Gross. She entered into eternal slumber on May 27, 2015. At age eight, she accepted Jesus Christ as her Lord and Savior and was baptized at Covenant Baptist Church in Southeast, Washington, D.C. In 2000 Charnice joined the Living Word Church of Southwest DC. She served as a songstress and faithful choir member and a diligent prayer warrior and youth leader. She graduated with honors from St. Thomas More Catholic School and Bishop McNamara High School. She received her Bachelors of Science degree with distinction and honors from Ball State University. In 2011 Charnice received her Master’s degree in Magazine, Newspaper and Online journalism from the Syracuse University S.I. Newhouse School of Public Communications. She was passionate in her craft and chose to remain in the city where she was born to give back by reporting local news. She joined the staff of Capital Community News, headquartered on Capitol Hill for more than forty years, in 2012. Charnice was a diligent and consistent correspondent for East of the River, a monthly print publication focusing on Wards 7 and 8, and the Hill Rag, a monthly print publication focusing on the greater Capitol Hill neighborhood. In her three years of writing for Capital Community News, Charnice filed hundreds of stories covering crime, education, small business, arts, development, parks, non-profit organizations, personal profiles and neighborhood news. Charnice is survived by her mother, Francine Milton her step-father Kenneth McClenton, step-sister Jasmine McClenton; grandmother Margaret Gross; step-grandparents Willie and Marva McClenton; God-Mother Jean Shamberger and a host of aunts; uncles; cousins and relatives.